It’s a typical winter’s night in Melbourne. The air is cold and the ground is wet from sporadic rain. Most people are at home watching TV or glued to their mobile devices, but in the bluestone basement of a North Melbourne bar, a man just laughed so hard beer came out his nose. The Melbourne International Comedy Festival has an attendance of up to 770 thousand people each year, and for many Melburnians this is the only time they see live comedy, despite comedy clubs running every night of the week in our city. So, what are people missing during the other 11 months of the year? Intimate spaces, impromptu moments and seeing comedians develop and hone their comedy. Seeing your favourite comedian’s festival show every year doesn’t mean you have heard all their jokes. A comedian’s material is limited in festival shows by a theme or storyline, but the short sets at clubs give them the freedom to talk about any topic. This was the case for comedian and Logie-winning TV personality Dilruk Jayasinha, when writing his 2018 comedy festival show, Bundle of Joy. “There were some bits that I really liked that I just couldn’t make them work in the whole show. So there will definitely be bits that don’t really fit in to the one hour show and without a doubt there is a huge difference in material,” he told upstart. Most comedians will tell you that solo shows take a lot of work to prepare. It is exhausting to do a full run and they are not always profitable. Having performed comedy in Melbourne for 20 years, Bev Killick is a Comedy Festival favourite, but this year her show Crummy Mummy only ran for two nights. “I hardly ever do a full festival show now. It’s s too draining. It is a lot of effort, plus I have kids that I need to think about and I want to make money,” she told upstart. That’s why many comedians focus on the year-round club circuit, where there is less financial risk, shorter set times and a variety of performance roles. Most club shows use an experienced comedian as a host, to start the show and introduce the acts. The number of acts varies and they do between five and 20 minutes depending on their experience and the show’s structure. Not all clubs or rooms fit neatly into a category, but there are three main types of shows available, with a different quality of act and price. First are the ticketed comedy clubs with prices ranging from $10 to $40 depending on how well-known the acts are. There can be a mix of well-known names and up-and-comers, but they are all doing tried and tested jokes. Next there are free entry rooms that have professional acts and up-and-comers. The professionals are usually trying out new material and the newbies are trying to impress. Free comedy nights are a great way to find your new favourite comedian. With no entry cost there is no risk and with a variety of acts you are sure to have some laughs. Jayasinha highly recommends audiences go to these rooms in the lead-up to the comedy festival to see big name acts for free and watch the joke editing process. “I find it a really riveting process for me personally to see a comedian I like work through an idea that didn’t quite work at the start and then seeing it later at the comedy festival come full circle. That’s always exciting,” he said. Then there are the open mic comedy nights. This is where comedians do their first set, practice performing and develop jokes. Open mic nights can have some great acts and some not so great acts – it depends on the night. One of the benefits of regularly going to free comedy rooms and open mic nights is you can watch acts improve and work their way up through the ranks. “I’ve seen some guys come through on the way. Ronny Chieng, Luke McGregor, Nick Cody, Dilruk Jayasinha, they all did a lot of spots here in their early days,” he told upstart. If you want to see Jayasinha, he is easy to find. This is because he is open to all venues. “I tend to go to any and every room, but some of my favourites, I like Spleen Comedy, the comedy nights at the European Beer Café, The Comics Lounge, the Local Laughs, Crab Lab there is so many,” he said. “The Comics Lounge is my prime room that I perform at, I go down the local as well,” she said. 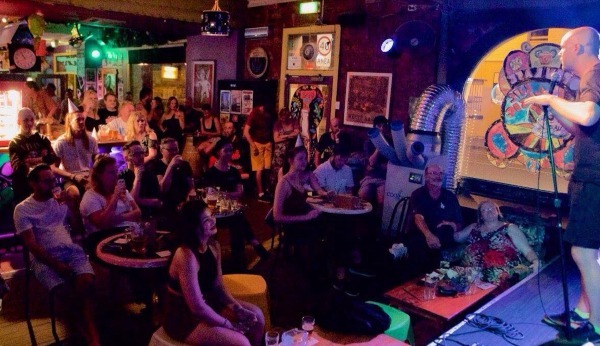 With the comedy festival and multiple clubs running every day of the week, Melbourne is a great city for comedians to develop and display their talents. Audiences get to see their laughter shape a performance throughout the year, and then watch the polished version at one of the world’s biggest comedy festivals. Now is the perfect time go to a comedy venue near you, to witness the art of stand-up comedy and have a good laugh.